. . press the space bar. .
. . . and click "Start"
Rayman, and press "Enter". . .
Press keyboard's right arrow key and this new window shows you the map properties of your new map1. but without the "Events". Press the key "E"
and you are inside the Event Editor Modus. All independent moving objects, called Events. You can insert these events in a map with the Event Editor. hold the right mouse button. With the arrow keys you move between the Event groups. To insert an "Enemy"event, move the menu with the arrow keys till "Enemies"
are indicated. Press now the arrow keys . . .
Is your decision "Hunter", let go of the right mouse button, and the hunter is inserted. 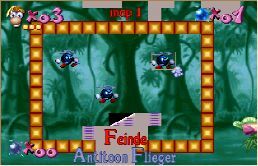 Delete an event: Click an event with your mouse button, and press the key "K"
Inside the worlds Mountains, Musicland, Imageland, Caves and Candyland are special enemies, only seen in these worlds . . . 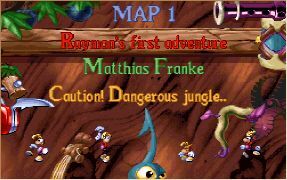 The Rayman's World startpage shows you all the Charactere/Events from the different worlds. "N key", and a new window shows you the event properties. now the N key. . .
. . . and you get these informations. The Gendoor is a invisible zone, represented by a wizard in the Events Editor . 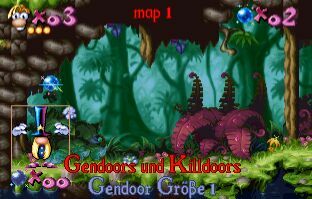 Inside the game, the Gendoor (Magician) is not visible. 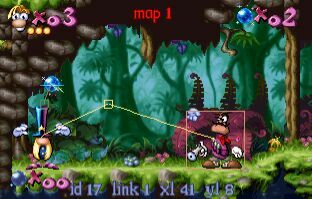 When Rayman enters the collision area (the area surrounding the Magician), all the Events that are connected to the Gendoor (Magician), will go into action (produce an effect). If Rayman dies, the Gendoor will be reset. He (the Gendoor) can produce the effect anew by Rayman. 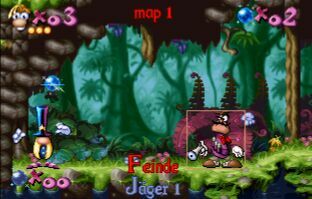 If Rayman enters the collision area of a Killdoor, all Events connected to the Killdoor disappear. The Gendoor is put back, if Rayman dies. He (the Gendoor) can produce the effect anew by Rayman. A Super Gendoor has the same properties as a Gendoor. 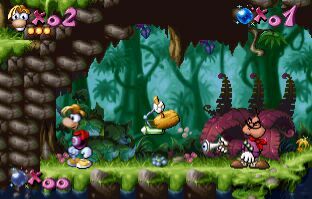 If Rayman dies after he produced an effect of a Super Gendoor, he (the Super Gendoor) will not be reset. 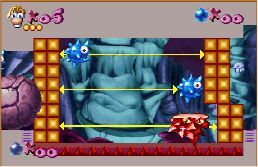 A Super Killdoor has the same properties as a Killdoor, but if Rayman dies after he produced an effect of an Super Killdoor, the Super Killdoor won't be reset. A Ting + works like an Super Gendoor. The Event will only appear when Rayman collects all Tings of the same color. You must link the Event and the Ting + with each other. A Ting- works like an Super Killdoor. The Event disappears only, if Rayman gets all Tings with the same color. You must link the Event and the Ting- with each other. 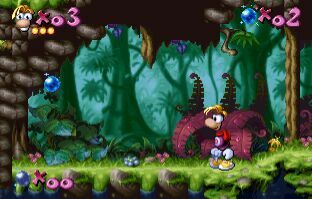 The Spark has the same properties, as a Gendoor, but Rayman has to activate it with his fist. (hit with fist) The spark is visible within the game. Press the key "I" and the "link" is shown with its red connecting lines. Here you see picture in link modus (I key). connecting line. Events are connected now. yellow and the link is activated. Press "I" key again (you leave the link menu), and save with key "S". Confirm saving with key "Y", and you are back inside Editor Modus where you can place more Events/Links. With "Links", it's possible to link several events. 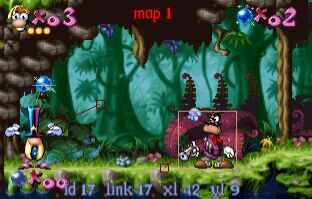 Maybe you want that an "Enemy" appears if Rayman reaches a "speacial place", you carry out the "Enemy appearing" with a "Link". 1) Gendoor and Hunter are linked. the left, collecting the blue ting . . .
4) . . . and enters the Gendoor's collision area. Moving events like . . . Inside the Event Editor you can insert types, too. Place mouse pointer now where you want to insert your type. Click and hold the right mouse button. Select with the arrow keys the type you want. Let go of mouse button and type is inserted. You delete a type with key "K". "Tips and hints, playing yours and the offical maps."